I always watch the prices for the high capacity, internal hard drives and noticed a nice price on Newegg (affiliate) which expires after February 28th. Amazon (affiliate) has my favorite tuner of all time, the SiliconDust HDHR dual QAM tuner for $126. 1. You don’t want an update to muck up things while you’re watching or recording your favorite shows. Most of these sort of updates require a reboot and you certainly don’t want your machine deciding to reboot during recordings now do you? 2. You might just want to wait a couple of days to be sure the update doesn’t have any unintended consequences – a few days is usually enough time to hear from other, more brave folks to tell us if bad things happen from the update or not. Improves the overall experience for systems that are configured by using digital cable card tuners. - I’m not sure what particular things this is focused on, but hopefully it will address the problems some CableCard users have been complaining about such as intermittent crashing etc. Resolves backward compatibility issues for some legacy Windows Media Center extensibility applications. Resolves an issue with how recorded TV shows are managed when switching to a user locale that is based on the Hijri calendar. Improves the overall experience when you use Integrated Services Digital Broadcasting (ISDB) tuners. ISDB is a Japanese standard for digital television and digital radio. MissingRemote has another Media Player Review up – this time the ASUS O!Play HDP-R1 Media Player. It sells for $99 and has a lot going for it. The non-extender, Media Player market is pretty competitive though so I wonder how many of these can survive in today’s tough economic environment without some sort of edge – like extender capabilities for instance. After living with both the Patriot Box Office and this ASUS O!Play HDP-R1 media players, it has proven difficult to choose a clear winner. I have centralized storage with torrent support in my Windows Home Server, so the inclusion of hard drive support and extras would be of no use to justify the extra $30 Patriot asks for its device. As the two compete features via firmware updates, I would imagine they would stay on par with each other as well, making the ASUS' sub-$100 MSRP a frontrunner. When you think of the TV remote control the first thing that comes to mind is something like this: A long, slender, candy-bar like device that fits in your hand and loaded with buttons to control your TV and other AV devices. And when you think of a computer mouse you think of the shell-looking object with at least on “clicker” – something you use to control the pointer on your computer. But what if you meshed those two devices into one and purposed it as a Home Theater PC remote control of sorts – that’s exactly what GlideTV has done with their Navigator device. It’s something quite unique in the world of remote controls and is the focus of today's in-depth review. GlideTV touts this new controller as “the worlds 1st couch mouse.” The fact that they call it a “couch mouse” in their marketing should clue us in that this is no ordinary remote control. 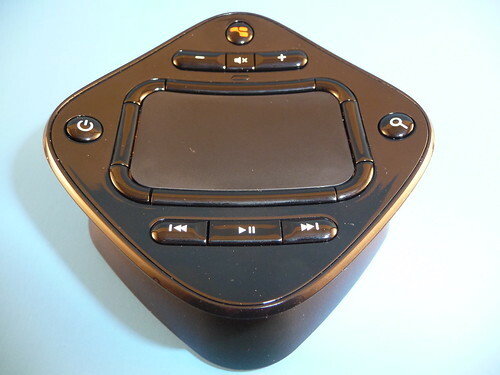 The GlideTV Navigator is sort of a remote-control, touchpad device with some well laid out hard buttons surrounding a touchpad in the center. The design is a good example of out-of-the-box thinking and while it takes some getting used to, it’s actually very functional. Read on for all of the details and my conclusion. We’re in the final week of February and the TV sets are on cruise control with all of the Winter Olympics on the air. It’s slim pickings here, but there are a few non-repeats on the set so read on. Don’t miss the Ultimate Guide to the 2010 Winter TV Season Premieres with free downloads by premiere date & by show name! I’ve updated this guide with some additions and network changes. School Gyrls (7pm on Nickelodeon) – A musical made-for-TV show where three freshmen (Mandy Rain, Jacquelyn Rae Pyles, Monica Parales) who love to sing and dance showcase their talents at an all-girl boarding school. Lost in the Nevada Triangle (8pm on National Geographic – Available in HD) - The disappearance of aviator Steve Fossett during a flight sparks a manhunt that shows dozens of aircraft have dropped from radar in California's Sierra Nevada mountains. Frontline – Behind Taliban Lines (9pm on PBS – Available in HD) – The PBS documentary newsmagazine returns with an Afghan video journalist travels a region that has reverted back to Taliban control; Pakistan's troubled school system. Live from Abbey Road (8pm on Sundance – Available in HD) – Season 3 premiere is here with Counting Crows, Sugarland and Seal among other artists remembering the the 40th anniversary of the Beatles' "Abbey Road"